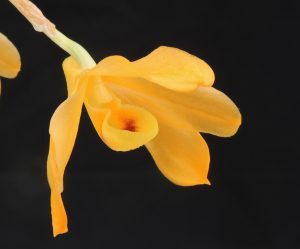 This is a warm growing dendrobium speices from the Himalayas through to South east Asia. We have seen plants growing in the hot valleys of Sikkim where we found it growing high in semi-deciduous trees. We also found it in the Lao city of Luang Prabang where it was abundant in trees along the river Mekong. The species has vary variable flowers both in colour and shape. The Sikkim plants had very large yellow flowers while in Luang Prabang the flowers were smaller but pink. 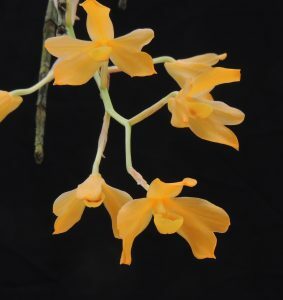 Our plants have bright orange flowers and the cupped lip characteristic of the species. We grow plants in baskets hung high in Warm Asia during the summer but moved to the coller conditions of Cool Americas during the winter to stimulate flowering.